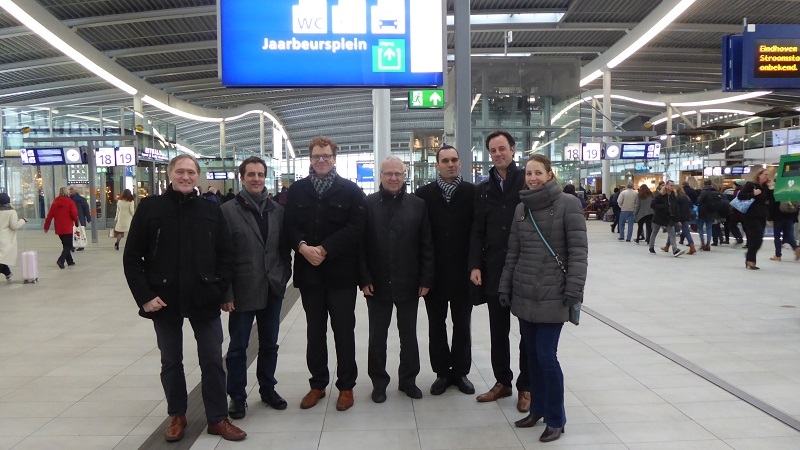 On 15 November a meeting followed by a technical visit dedicated to the Utrecht Station Project was held within the frame of the SUSTAIN (Sustainability in Stations) Project of the Stations Managers Global Group (SMGG) of UIC. ProRail and NS representatives provided a complete description of the main elements of the project, including all the urban planning interfaces and the holistic conception of transport intermodality included in the project. The technical visit included a tour in the station to the most relevant aspects implemented in the project. The visit highlighted the building developments attached to the rail station, such as the Town Hall and the main commercial centre of the city, making the area the main activity and functional hub of Utrecht, providing transport, commercial and administrative services. The station design includes other relevant elements for its integration in the city, such as an open space for transit users in order to avoid urban barrier effects for the population, or cycle parking, with a total planned capacity of over 20,000. This project responds to the requirements of increasing the capacity of the station according to transport demand, which is set to triple by 2030 compared to 2006. The project has been developed thanks to close cooperation between national, regional and local administrations and the rail sector, in addition to the private and commercial sector of the area. The official inauguration of the project will take place next December. The participants had the possibility to obtain more information about the project’s actions on (among others) energy efficiency and environmental management, such as LED lighting, solar panels, natural ventilation designs, waste management and plans for smart grid implementation. The Utrecht Station project will be included as the main study case of the SUSTAIN Project, started last May within the Stations Managers Global Group of UIC. The ongoing project is jointly managed by IZT and Macroplan Consulting in close cooperation with the Passenger Department and the Sustainable Development Unit of UIC. All additional contributions from members on best cases and experiences are welcome to be included in the project.